EURUSD has not been volatile in spite the fact that yesterday several economic reports were published and Yellen and Draghi spoke. The support rests at 1.17470 with resistance at 1.17700 which both lines are below the weekly pivot point at 1.18220. The EMA of 10 is moving horizontally in the ascendant channel and it is below the EMA of 200 and the EMA of 100. The RSI is moving on the 50 level, the Stochastic is showing downward momentum and the MACD indicator is in negative territory. The ADX is not showing any clear signals. 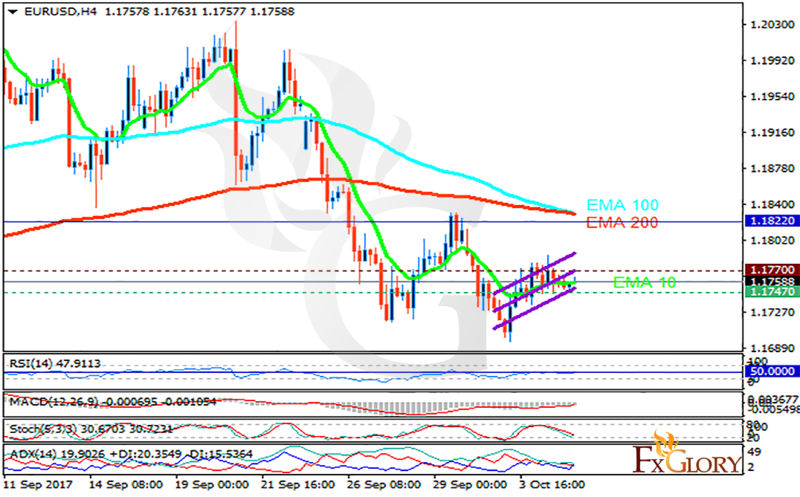 The support level breakthrough will ease the way for price decline towards 1.15 area, otherwise it will grow to 1.18.